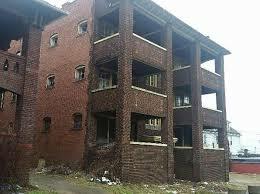 Cleveland It is almost gospel among community organizations and their leadership to rehabilitate housing first and only demolish as a last resort. At the same time few community organizers have not heard the plea from their members that abandoned and derelict properties are huge issues for safety and home value and acted upon those demands. The statistics also make the neighbor’s case and prove it repeatedly. A study several years ago established that abandoned or vacant homes even blocks away lowered home values appreciably. When I was in Cleveland several months ago I studied closely the work that the Thriving Communities Institute and its lead researcher, Frank Ford, published making their case, admittedly counterintuitively, that demolition of abandoned houses did more to restore neighborhood value that rehabilitation did. I have to concede having closely examined their numbers that the data seems to make that case from what I can tell, so I acknowledge it intellectually, but in my heart I’m still not there. Spending several hours with Jim Rokakis, Frank Ford, and Jay Westbrook, I was once again indoctrinated on this issue, but what moved me more, though on a different but related issue, was touring several Cleveland neighborhoods with Jim. In some amazingly effective political and organizational work, Jim and the Thriving Communities team had pulled millions out of the bank settlement and other hats by making the case for demolition to save neighborhoods, and that work has funded the demo of thousands and thousands of houses in the area. But, the demo money, pried loose as part of the impact of the foreclosure catastrophe over the last decade, was restricted to single and double residential units, and specifically barred use of the money for multi-unit apartments whether fourplexes or more. A picture book had been open on the table in front of us that showed hundreds in disrepair, too expensive arguably to rehab given the market and location. They had made the book to make their case, and their case was rejected. Driving through the neighborhoods, these complexes stood out dramatically especially since they often abutted vacant lots where demolition had already occurred. The worst block in East Cleveland was a street with four story, brick apartment complexes on both sides, all abandoned and blown out. The developer is long gone, the owner long bankrupt through whatever shell had held these properties, so who and what can make this community whole. Jim pointed out that the track, if cleared, would be an 18-acre development plot for something. What does it take to get there? A lot more than a hope and a prayer. Similarly, commercial properties couldn’t be demolished with the money, and the same problem holds, perhaps even more clearly because these properties, having been about business and popular access, line the streets and corners of the neighborhoods, concealing in their blight the hidden treasures and opportunities behind them. I’m still a rehab and rebuild guy first, and I’ll do my best to convince anyone and everyone, that the same kind of money that went into demolitions, needs to go into rehab and new construction of affordable housing for low-and-moderate income neighborhoods. At the same time, we all have to admit, that both rehab and demo need to go hand and hand in a comprehensive program, even if rehab and construction should be in first place and destruction in second. Please enjoy Willie Nelson’s Me and You. This entry was posted in Citizen Wealth, Financial Justice, Foreclosure and tagged affordable housing, housing demolition, housing rehab by Wade. Bookmark the permalink.